(Nanowerk News) Pure carbon occurs in many forms. Besides the classical configurations found in diamonds, graphite, and coal, there are other younger exotic cousins such as graphene. Its structure resembles a honeycomb - a hexagonal mesh with a carbon atom at every corner - that is only a single atomic layer thick. Hence, it is essentially two-dimensional. As a result, graphene is extremely conductive, completely transparent, and quite resilient both chemically and mechanically. It has long been known that graphene is also fundamentally suited to detecting traces of organic molecules. This is because the electrical conductivity of graphene drops as soon as foreign molecules bind to it. The problem, though, is that this happens with almost every molecule. 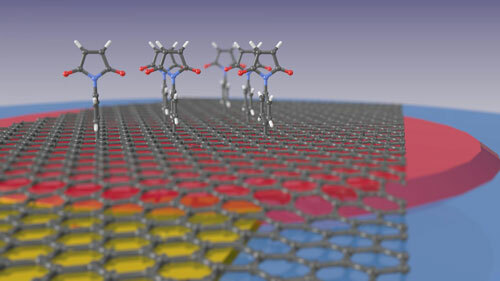 Graphene is not very selective, which makes it very difficult to differentiate molecules. Therefore, it cannot be used as a sensor. Now a team from the HZB Institute for Silicon Photovoltaics has found a way to increase the selectivity. They were successful in electrochemically activating graphene and preparing it to host molecules that act as selective binding sites ("Quantifying the electrochemical maleimidation of large area graphene"). To accomplish this, para-maleimidophenyl groups from an organic solution were grafted to the surface of the graphene. These organic molecules behave like mounting brackets to which the selective detector molecules can be attached in the next step. "Thanks to these molecules, the graphene can now be employed for detecting various substances similar to how a key fits a lock", explains Dr. Marc Gluba. The "lock" molecules on the surface are highly selective and only absorb the matching "key" molecules. Other research groups had also carried out experiments along these lines. However, they only had tiny graphene flakes with diameters in the microns available to them, so that edge effects predominated. Meanwhile, physicists and chemists at HZB produced graphene surfaces several square centimeters in size so that edge effects play hardly any role in comparison to the surface processes. Then, they transferred the graphene layer to a quartz crystal microbalance. Any increase in mass alters the oscillatory frequency of the quartz crystal that even small amounts right down to individual molecular layers can be measured. "For the first time, we were able to precisely and accurately detect how many molecules actually were grafted to the surface of the graphene", reports junior researcher Felix Rösicke, who investigated this problem for his doctoral dissertation. "In addition, we can precisely control how many molecules bind to the graphene by adjusting an applied voltage", explains Dr. Jörg Rappich from the HZB Institute for Silicon Photovoltaics, Rösicke's advisor. "The hopes we have for graphene are really enormous", says Prof. Norbert Nickel, head of the research team. For example, one thing you could imagine would be a really inexpensive "lab-on-a-chip" - you would apply a single drop of blood and immediately obtain data for important medical diagnostics.